How much better could you sleep at night if you knew for certain that you were walking in the light? How much better could you function during the day if you had absolute confidence in your salvation? Don’t you wish there was a test or a formula Christians could use in order to know at any given moment where they are in their relationship with God? 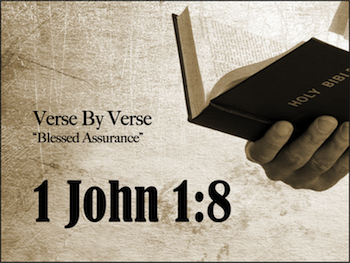 In verse 8, John offers the first question on the test of assurance - are you being honest about your sin? Much like an alcoholic cannot journey toward recovery until he concludes that he has a problem, a Christian cannot remain on the journey of salvation until he is honest about his condition. Anyone who demonstrates pious self-righteousness and looks down upon the sins of others with pharisaical satisfaction can be assured they are neither on the path nor a benefit to God’s work. As was mentioned in the comments about verse 7, salvation is not a point in time, it is an ongoing process. (See Philippians 2:12) This process continues both in the hearts of men and in the presence of God. He went to great lengths to purchase our salvation and, in return, He expects - no, God demands that we be honest about our continuing struggle with sin and acknowledge the One upon Whom we depend for cleansing. It is also important to note from this verse that walking in the light does not require sinlessness. In fact, according to the first ingredient in the formula for assurance, the only way a person can be in the light is if they admit they are a sinner. Salvation does not depend upon our goodness, it depends upon our honest submission. The legalism of the Old Law could not save and it certainly does not lead to salvation under the New Law either. Walking on the path of light does not involve a continuous check-off list of righteous acts (church attendance, hospital visitation, communion consumption, etc. ), it involves a continuous honesty about our sin and the hopelessness of trying to save ourselves. Jesus once said, “If you love me, you will obey what I command.” (John 14:15) In other words, followers of Christ should obey in order to offer the Lord a heart filled with love, not a check-off list of completed duties. To stay on the path of light, obedience must be born of love for Christ not legalistic servitude. Gabriel, age 5, had discovered the power of the word “No!” He experimented with this newfound power by using it in response to his mother’s commands. Unfortunately for him, the results were not what he had hoped. Several sore bottoms and a few tear-filled moments in timeout curbed his usage quite effectively. Although Gabriel’s obedience in this matter was important, his submission was not born out of love, it was born out of the dread of punishment. He submitted not because he wanted to, but because he had to. Is your Christian journey a painful struggle of “have to’s” or is it a fulfilling adventure of “want to’s?” If your walk is filled with drudgery and your path seems almost too steep to climb, it might be because you are not being honest about who you really are and what you really need. You cannot save yourself. Admit it, you are a hopeless sinner. The first ingredient to the formula of assurance is brutal honesty about who you are and your desperate need for the Savior. Serve Him because you love Him. Submit to Him because you trust Him. For assurance to be sure, we must let God speak for Himself. We must be true to the inspired context. After each study, read the entire chapter again taking note to the way today's verse relates to all the verses around it. Due to the colorful, complex nature of the original language, the best translation is multiple translations. Following each lesson, this chapter will be presented in a different translation. Below, we have featured Webster's Bible Translation. That which we have seen and heard we declare to you, that ye also may have fellowship with us: and truly our fellowship [is] with the Father, and with his Son Jesus Christ. This then is the message which we have heard from him, and declare to you, that God is light, and in him is no darkness at all. If we confess our sins, he is faithful and just to forgive us [our] sins, and to cleanse us from all unrighteousness. Missed the first eight parts of this study? Check them out! "Jesus - Eternal Life: 1 John 1:2"
"Fellowship With the Father and the Son: 1 John 1:3"
Back to Top of "Formula for Assurance: Honesty"